Have you ever been in love? I would guess about 90% has probably really said and/or felt the “L” word. There’s a difference between saying you love and actually being in love. Love is a tricky feeling. It starts off so magical. The feeling is surreal. You give your all and sometimes things change. That magic is far and few in between. You start to notice things that really bother you but you still continue to love. You still give your all in efforts to get the same in return. When I first seen this quote I was like “Hell Yeah! I am owed love” I had to read it over a couple of times to really get the meaning. I had not be bias for what I am going through and open my mind to what @daeizm was really saying. I had to let go of my anger and get deep down into the truth. Truth is a lot of us, as normal human beings, want what we give out (especially if its something good). We feel as though this is the way it should be but reality is this not how it is. When it comes to love there should never be a reward expected. If its true, you should just love and that’s it. Not looking for a gain of anything. I struggle with this. Only because that’s all I have to genuinely give. I constantly tell my Ex that he doesn’t love me because I feel as though I am not getting what I am owed. But what can really be a reward? You say all I want is this for this, but its funny cause if it was pure that’s not what it would be. I can say sometimes we don’t even realize what we are doing expecting something for the love we are giving out. It’s just becomes second nature. I have to be honest and say I can’t say this is a human thing. I going to be blunt and say this is majority a female thing and I know because I am a female. We give out love expecting a relationship, gifts, or the ultimate thing marriage. I wouldn’t say just give out love all willy nilly. I wouldn’t advise you just love just anybody. I am saying when you love the right person love them for who they are, expect nothing and I am pretty sure you will get everything you ever dream. This is not because you emoted (portray an emotion in a theatrical manner) “love” but because you actually loved wholeheartedly. You can see the difference. I see the difference as I write this post and think about all of my situations with my Ex. I loved him but I couldn’t get passed just loving him and that’s it. 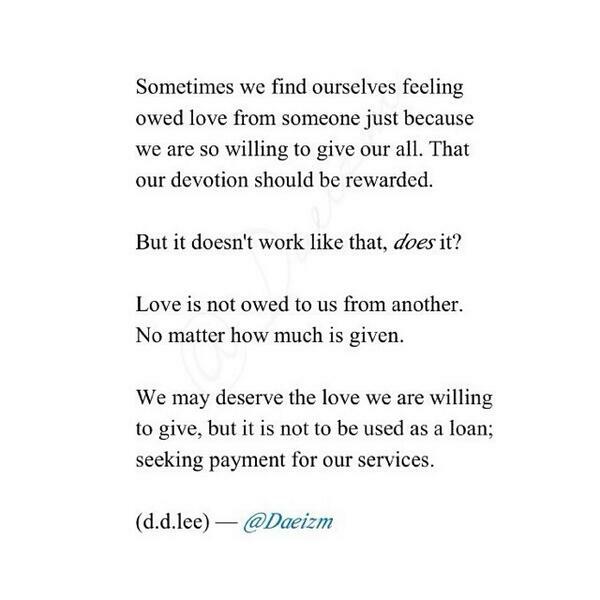 I need love in return and like @daeizm says love is not a loan. Oh FuZz! 1000 Word Pic.